Take photos of landscape, flowers, animal and self-portrait with Hizek lens, enjoy wonderful photography experience. It is not only the rose and chocolate for your lovers, share the happiness moment with her! Can shoot larger range of landscape and building, group of people and self-portrait,capture the happiness moment with your friends and family. Can capture many funny scene of 180-degree, suitable for most objects, which takes you into a stunning fantastic world. Suitable for insects and flowers, coins and small objects. 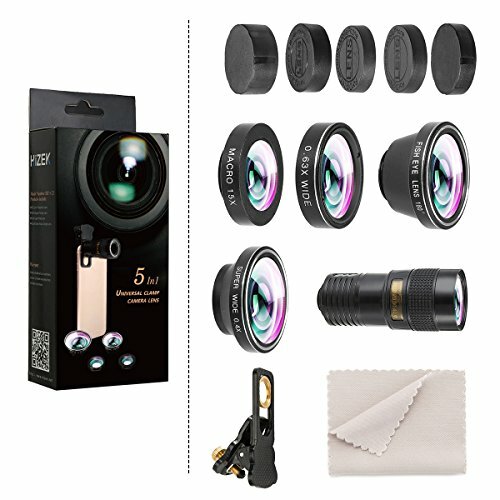 5 in 1 Phone Lens Design -- Designed by 9X Telephone Zoom Lens+180 Degree Fisheye+Super Wide 0.4X+ 0.63X Wide and Macro Lens. Multi-function in one design convenient for you to take a variety of styles of photos. More Fun in Photos -- 180 Degree Fisheye Lens support phone/Pads to shoot fun circular pictures; Wide-angle lens can shoot landscape or even group pictures; 9X telephoto zoom lens can take pics of long distance. 0.63X macro lens can take pics of small objects like flowers. Enhanced Design -- Aluminum alloy frames not only can enhance the durability of the product, but also can enhance the light transmission to make the image becomes brighter. High Compatibility -- Compatible with wide range of cell phones and mobile devices including iPhone 7, 6, 6+, 5, 5C, 5S, 4, 3; Samsung Galaxy S6, S5, S4, S3; iPad Air,etc. NOTE -- It works on most types of smartphones that camera lenses diameter is smaller than 13mm; The Macro and Wide Angel lenses are attached together upon arrival and can be separated to use the Macro individually. If you have any questions about this product by Hizek, contact us by completing and submitting the form below. If you are looking for a specif part number, please include it with your message.